“My Story" Quilt is what this quilt was called by a very happy customer. Through tears she explained that the story begins with Girls Scouts in 1973-see the Girl Scout Vest, yellow jacket and patches sprinkled throughout, then comes her beauty pageants in the late 1970’s-see her 3 pageant banners and her cream colored gown that she wore. College is next with Alpha Phi and the many memories that Greek life provided! Simply beautiful is the story of her life! Kudos to Lory for saving all of these precious items! Shown below is a traditional style quilt with friendship star sashing filled with St. Joseph's University Music t-shirts! How many running shirts from races can one collect? 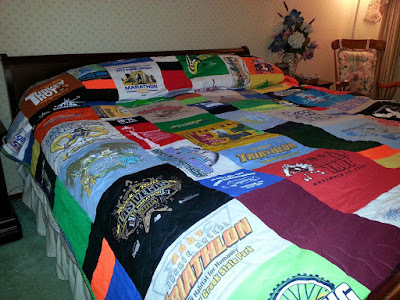 This modern style, king size quilt used 60 marathon race shirts! Miles of memories are reflected in this work of art. Shown below is another Modern style twin size extra long quilt filled with DISNEY marathon shirts! How many t-shirts does your child have from all of the sporting events that they have been involved in? I bet drawers and drawers full! Turn them into a beautiful quilt that will illlustrate their flair! Seen below are quilts that show field hockey, travel, and gymnastic talent! Below is a picture of a gymnastic quilt that contains 12 gymnastic leotards! Below is a another gymnastic quilt that contains lots of BLING! So many memories! How many travel t-shirts do you have piled in a closet? HOG shirts are pieces of art within themselves! Put them in a Memory Quilt and they become a tapestry of art! The sashing (fabric around the blocks) on this quilt was selected because it looks like the road! 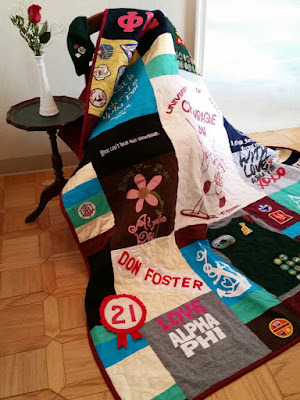 These t-shirts in this modern style lap t-shirt quilt came from all over the world! How many Hard Rock shirts do you have? There are so many fun things that we do and our t-shirts reflect this! 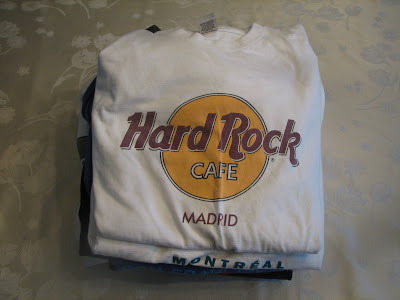 Do you have a collection of Pub shirts, or Hard Rock Cafe shirts, or how about Harley Davidson t-shirts? Turn them into your very own custom Pub Quilt or Hog Quilt or Hard Rock Cafe Quilt! The possibilities are endless! What shirts do you have just waiting to made into a Memory Quilt? Let me know!